Product #213 | SKU MSP5PAIR | 0.0 (no ratings yet) Thanks for your rating! 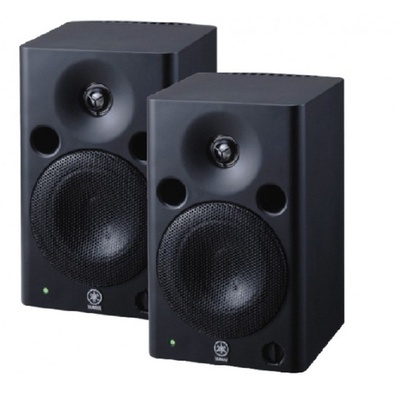 The MSP5 from Yamaha is a high-quality nearfield studio monitor designed for use in smaller studio spaces. The bass-reflex cabinet houses a 5" woofer and a 1" dome tweeter to provide accurate sound with a frequency response of 50Hz to 40kHz. The cabinet is magnetically shielded for safe use near video monitors. Balanced XLR and unbalanced 1/4" input connectors allow you to connect a wide variety of professional audio equipment to the monitor. High and low trim switches on the rear panel allow you to adjust the monitor for the best performance in your particular workspace.